TOUR GUIDE RESPONSE: Thank you very much. It was an enjoyable day with you all. Glad the grandkids enjoyed the impromptu scavenger hunt as well. Robbie was friendly and accomodating and gave us a wonderful tour of his city. TOUR GUIDE RESPONSE: Thank you very much. It was great to meet you both and to be able to show you around my beautiful home. I hope you enjoyed the rest of your cruise. Robbie was outstanding and made our visit most enjoyable We would give him a 5 star. TOUR GUIDE RESPONSE: Thanks very much John. It was great to meet you all and to be able to show you around my beautiful home. Glad you enjoyed the day and the lunch at Chocolate Fish Cafe. I wanted to give my highest rating for our guide Robbie! We had him 2 days in the Wellington area mainly for LOTR sites. He is knowledgeable and flexible. Kind and considerate demeanor. Also answered emails in a timely manner. Has lots of stories on set to tell and genuinely values his guests happiness. We also did a hike at the Pinnacles along with a city tour of filming sites. DO NOT hesitate to book this guide. Our time in NZ was greatly enhanced by this private tour!! TOUR GUIDE RESPONSE: thank you very much Cindy. It was great to meet you both and to share some of my on-set experiences with two eager fans as yourselves, as well as the other places we got to visit. Loved seeing your photos as well. TOUR GUIDE RESPONSE: Thank you very much. It was great to meet you all and it's always my privilege to show you around my beautiful home. I'm glad you enjoyed your time here and I hope you enjoyed the rest of your cruise. Robbie T knows all about LOTR having participated as an extra during the filming. Other guides along our trek deferred to him. He is full of stories that bring the bits of earth to life. He is very prepared to "teach" all that he can and laces the places with tales of orcs and uruk-hai, elves and men of Rohan. His expertise extends beyond LOTR as he also knows most parts of New Zealand. When we return we will ask him to guide us beyond the region of Wellington. He survived Helm's Deep and we are grateful. TOUR GUIDE RESPONSE: Thank you very much. Having died many times at Helm's Deep, I was indeed fortunate to survive to be able to show you around. I'm glad you enjoyed the stories and locations. TOUR GUIDE RESPONSE: Kia ora ladies. Thanks very much. It was great to meet you both and share some of my on-set stories with two fans of the movies/books. And yes, of course I'll take the credit for the weather. TOUR GUIDE RESPONSE: Thanks very much for the rating. It was great to meet you and to share some of the highlights of my beautiful home with you. Hope you enjoyed the rest of your travels. Great day with Robbie! Extremely familiar with the area and very personable and accommodating. Most enjoyable. A special treat for Lord of the Rings fans! TOUR GUIDE RESPONSE: Thank you very much Zack. It was great to meet you all and to be able to show you around my beautiful home. Glad that you enjoyed the day and the extra little bits thrown in. TOUR GUIDE RESPONSE: Thanks very much Cynthia. I enjoyed meeting you all and being able to show you around my beautiful home, especially after the weather cleared up. Enjoy the rest of your travels. Robbie was fantastic. We so much in one day! Amazing. We loved seeing Katherine Mansfield's home & statue. Highly recommend Robbie. TOUR GUIDE RESPONSE: Thank you very much. It was great to meet you all and to show you so much of my beautiful home. I'm glad you all enjoyed yourselves. We enjoyed a great day with Robbie. He is so knowledgeable. Robbie tour of Wellington was so awesome. He has so much knowledge about Wellington and the Maori people. Mt. Victoria overlooking Wellington was so beautiful. We went on the cable car and walked through downtown Wellington and had lunch with the locals which was delicious and such a quaint restaurant. We saw the main sites of Wellington and more. Robbie was fun and very enthusiastic. He had a nice vehicle which was perfect for four of us. Great private tour. Way to go with Robbie! TOUR GUIDE RESPONSE: Thank you very much Gail. It was great to meet you and I'm glad that you enjoyed it all, especially Mt Victoria and lunch at the Chocolate Fish Cafe. I hope you enjoyed the rest of your cruise as well. This tour was excellent. Robbie was Amazing. We had 2 young children with us and Robbie was so flexible and accommodating to our wants and needs on the tour. He picked us up from our cruise ship dock, and the day was so enjoyable and stress free. We all had a great time. Robbie had really great knowledge of the area, and had modified the tour slightly to suit our own interests. I highly recommend Robbie, and would definitely do another tour with him, if we ever returned to Wellington. TOUR GUIDE RESPONSE: Thanks very much. It was great to meet you all and your kids behaved amazingly well too. I'm always happy to change and adjust on the day as necessary. We had a great time touring Wellington with Robbie! A private tour is the way to go because Robbie was very flexible to our needs while at the same time recommending all the key sites we should see in his home town. We learned he is a history major so his historical knowledge of Wellington and New Zealand is excellent. Something that fits well with my husbands thirst for knowledge. Being in the New Zealand's capital city was very special and Robbie made sure we experienced all that was special here. TOUR GUIDE RESPONSE: Thanks very much Robyn. It was great to meet you both yesterday and share some of the highlights and some of the history of my home town with you. Hope you didn't get too sunburnt and enjoy the rest of your travels. TOUR GUIDE RESPONSE: Thanks very much. It was great to meet you all and share some of my on-set experiences with you, as well as giving you an insight into the world of movie-making. You'll watch the movies with different eyes now. My wife told Robbie that this was the best tour we have taken. If she is happy I am happy. Robbie met and then exceeded our expectations. We highly recommend him. TOUR GUIDE RESPONSE: Thanks very much guys. It was great to meet you both and share your anniversary with you. All the best for the rest of your travels and I hope your family spoils you when you get home. TOUR GUIDE RESPONSE: Thank you very much Tammy. It was great to meet you all and share some of the highlights of my home with you. Robbie is just great... I totally recommend him. TOUR GUIDE RESPONSE: Thanks very much Jorge. It was great to meet you and your family and to be able to show you some of the highlights of my home. I hope you all managed to get some sleep and recover from the jetlag OK.
Robbie was a great tour guide for us. He was very committed to fit in as much as possible, yet he didn't push us at all on time. He has an incredible sense of history in the Wellington area as much of his family is from there. His tour is extremely interesting and engaging. The rose gardens were absolutely beautiful, the cable car was fun and we had a very tasty lunch. We would highly recommend Robbie for anyone wanting to tour Wellington. He is very interesting to listen to and fun to be around. TOUR GUIDE RESPONSE: Thanks very much. I enjoyed meeting you both and being able to have a leisurely day in Wellington. I hope you enjoyed the rest of your cruise and thanks for your kind words. Robbie was a great tour guide and the 4 of us had a delightful time exploring the Wellington area and the Weta Workshop. We love discovering places that are a favorite of locals, and again Robbie did not disappoint. We had a great lunch at the Chocolate Fish while looking out over the water. We only wish we had more time with him to discover more of Wellington's treasures. Excellent tour. We give Robbie 5 stars. He was extremely knowledgeable and humorous and welcoming. We highly recommend him. Loved the cafe he took us to for lunch. He helped us enjoy Wellington in the rain. Mike and Lydia L.
TOUR GUIDE RESPONSE: Thanks very much guys. It was great to meet you both and to make a rainy day in Wellington enjoyable. (I'm particularly pleased that I managed to stop the rain during our scenic stop at Mt Victoria!) Enjoy the rest of your travels. Robbie did an outstanding job in showing us Wellington. An added bonus was his Lord of the Rings background and showing us some film locations. He was very knowledgable and friendly and fun to tour with! We highly recommend him to anyone visiting Wellington. TOUR GUIDE RESPONSE: Thanks very much guys. I really enjoyed meeting you both as well and being able to show you some of the highlights of my beautiful home, and I'm glad you enjoyed the little extra bits we managed to do as well. Robbie was wonderful. There was 3 in our group, my dad who is 78 was with my husband and I. Robbie made the trip enjoyable for all. He knows the area well and it was a great idea. He knew we wanted to stop at a few gift shops and had a fantastic lunch spot where we ordered the best fish sandwich. Highly recommend a day with Robbie. TOUR GUIDE RESPONSE: Thank you very much Lynn. It was great to meet you all and to share my beautiful home with you all. And I'm glad you managed to pick up the souvenirs you wanted - it was not a problem to include those stops. Robbie was a lot of fun to be around. He was definitely knowledgeable and informative. We saw a lot in a short time from beach to hills and still had relaxing and very nice meal. TOUR GUIDE RESPONSE: Thanks very much. It was great to meet you both and to share a beautiful day in Wellington. Hopefully we'll see you again on your next world travels. We had a very enjoyable tour with Robbie. We particularly liked the filming location of The Lord of The Rings, and his insight on being an extra in the films. Being able to bypass the long line of tourists waiting for the cable car was a definite plus also. If you get a chance to go to the LOTR gift shop, you should go, even if only to get photos of yourself with the life-size characters. TOUR GUIDE RESPONSE: Thanks very much. It was great to meet you all and to be able to show you around and, yes, by-passing the queues at the Cable Car is just one of the services I offer. :-) Glad you enjoyed the Weta Cave as well. Something a little bit different. TOUR GUIDE RESPONSE: Thanks very much Jean. It as great to meet you all and to share some of my on-set experiences with such enthusiastic fans of the book and movies. Hope the photos and videos came out OK as well. Very enjoyable. Robbie was extremely knowledgeable and went out of his way to make the trip interesting, informative and fun. TOUR GUIDE RESPONSE: Thank you very much. It was great to meet you and to be able to do something a little bit different. Glad that the golf went so well for you as well. We had a great tour with Robbie. We saw on his tour more than we would have seen on three of the ship's shore excursions put together. He was very informative, willing to adapt the tour to what interested us, and knew how to get us around to avoid crowds. Highly recommended. TOUR GUIDE RESPONSE: Thanks very much. It was great to meet you both and to show you around my beautiful home. It doesn't always work but I'm glad we got to avoid the crowds for you. Robbie was fabulous! A great personality and extremely knowledgeable! You could not find a better guide in such a lovely city. TOUR GUIDE RESPONSE: Thank you very much. It was great to meet you all and I'm really glad the weather cleared up and you got to see so much of my home. Hope you enjoyed the concert at St Pauls and safe travels. Robbie was delightful and full of interesting knowledge! He was organized (did the busiest places first to avoid crowds) and provided wonderful information to help us understand historical and government buildings. He was great to tailor stops to us and our likes and tolerate my quest for pictures. Great lunch spot and interesting places! Thanks Robbie! We'll definitely send our kids to see you! Ice guy very knowledgeable, had a great day. TOUR GUIDE RESPONSE: Thank you very much. It was good to meet you two as well and to be able to show you around my beautiful home and to share some of my knowledge with you. Safe travels for the South Island. Please look no further! Robbie is your guy! I've used Tours by Locals tons and Robbie is by far the best of the best! Very friendly and knowledgeable with a lovely NZ accent! Book your tour now! TOUR GUIDE RESPONSE: Thank you very much Pam for that great recommendation. Your commission is in the mail. ;-) I had an enjoyable day with you all, being able to show you some of the highlights of my beautiful home. I hope you enjoy the rest of your cruise and your travelling around NZ afterwards. Robbie is a great tour guide. Very well versed on the Wellington area. He gave us a great tour and did his best to avoid the big tour buses. Learned much anout the area and he hit a little on the filming of Lord of the Rings. He also offers a tour specific to that and was cast in the movie, so his knowledge is great! Took us to a great local spot for lunch with amazing food. I would highly recommend Robbie for his services when visiting Wellington. TOUR GUIDE RESPONSE: Thanks very much. I had a great day with you all, despite the moody weather. I also passed on your compliments about the seafood chowder to the cafe. Much appreciated. TOUR GUIDE RESPONSE: Thank you very much Shirley. It was an enjoyable afternoon with you both, getting to see some of the highlights of Wellington. Robbie picked us up front the cruise ship and arranged our schedule so that we were able to miss some of the worst crowds. 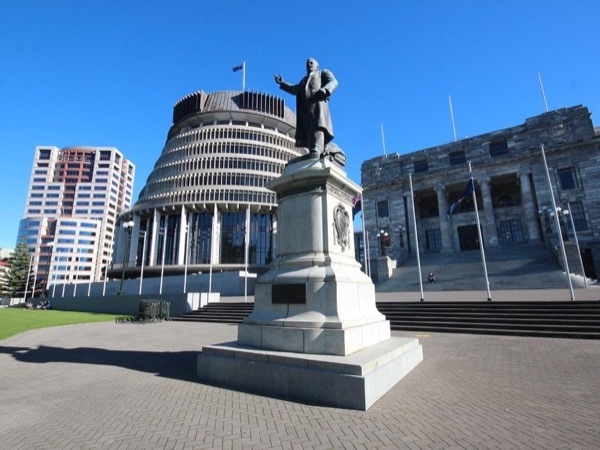 Since Wellington is the capital of New Zealand he shared some of the government buildings and introduced us to documents that were important to New Zealand and the Maori culture. We had some time after the tour so Robbie dropped us off at a museum to visit before we returned to the ship. We enjoyed our day with Robbie. TOUR GUIDE RESPONSE: Thanks very much. I enjoyed meeting you all and being able to share some of our local and national history with you all. I'm glad that you appreciated being able to see some of our historical documents - it has been an added bonus for me since they made them available. Robbie impressed us with his depth of knowledge, lively commentary and accommodating manner. We thoroughly enjoyed our time with Robbie and would not hesitate to book him again. TOUR GUIDE RESPONSE: Thank you very much Jayne. It was great to be able to take you all around and show you the sights of my wonderful home, including all the little extra bits we got to visit. I hope you enjoyed the rest of your cruise. Had a great day with Robbie. Tour was as described and we got to see city sights as well as ZEALANDIA. We all also enjoyed the cable car ride and the walk around the downtown. He comes highly recommended. TOUR GUIDE RESPONSE: Thanks very much Robin. It was great to meet you all and to share some of the highlights of my home with you. Glad you got to experience so much at Zealandia as well. Thank you Robbie for making our visit to Wellington so enjoyable. I would highly recommend Robbie - not only his extensive knowledge of Wellington, but for also showing us all aspects of this fabulous city beyond what the original tour included. From the historic city centre out to the Weta Workshop, and a safe return to our cruise ship, our very limited hours in Wellington were filled with excellent sights and information. TOUR GUIDE RESPONSE: Thanks very much. It was a good day with you all, despite the fact it was so limited. Next time you're in town for a longer period, I'd love to do the rest of the LOTR sites in Wellington with you - including a lot more of my on-set stories than what I was able to share with you. TOUR GUIDE RESPONSE: Kia ora Don. Thank you for your rating. It was good to meet you both and to be able to show you around my beautiful home at a nice, leisurely pace. Robbie was very informative and was a pleasure to have with our family for the day. TOUR GUIDE RESPONSE: Thanks very much guys. The day was a lot of fun and I really enjoyed being able to share my stories with you all. i hope you enjoyde the rest of your travels through NZ and Middle-Earth. Robbie did a great Job, everything was on time and we spend a lovely day. We enjoyed the day very much and he offered a lot of options. In case we return we will definitely try to book this guy again. TOUR GUIDE RESPONSE: Thanks very much Joerg. It was great to meet you all and to be able to show you around. And yes, next time you visit, I would be happy to show you around again. Robbie was wonderful. He was friendly, funny, and very informative. He kept things Very light and yet we learned so much and saw so much of the city and its surroundings. He hit the major sights that all of our guide books were recommending and he also tailored to tour a little bit to our groups needs and wants. I highly recommend Robbie to introduce you to the beautiful city of Wellington. TOUR GUIDE RESPONSE: Thanks very much Irene. It was great to meet you all and to be able to show you so much of my home, especially on such a beautiful day. Robbie picked our group of six up at our cruise ship. He had put together a tour to address the requests of each of us - see the countryside, see some local art and see the wildlife (in New Zealand, that means birds). Robbie provided us with a comfortable ride while using a microphone to make sure we heard his commentary. He was very knowledgeable and able to answer all of our questions. He provided us with a most pleasant day. You will not be disappointed if you choose Robbie as your guide. Robbie was the ABSOLUTE best! Could not have had a better tour guide that was more knowledgeable than him! His passion for New Zealand resonates throughout the tour and the small group size allows for us to go to filming locations not available on big cruise tours. I feel confident in my knowledge now of LOtR thanks to Robbie and plan to share my knowledge with my friends. If I ever get a chance to take the tour again I will 100%. Robbie goes above and beyond to make the tour amazing. TOUR GUIDE RESPONSE: Thank you very much for your rating. I really enjoyed my day with you all and I hope you enjoyed watching the movies with a new understanding of how they were made. We had a thoroughly enjoyable day with Robbie. He's very knowledgeable of the area and was an extra in the LOTR movies. If you are a LOTR fan, you will love this tour. TOUR GUIDE RESPONSE: Thank you Linda for your rating and kind words. I had an enjoyable day with you all as well, sharing some of my stories and re-creating some of the scenes of LOTR. I hope you enjoyed the rest of your cruise as well. Robbie gave us a good introduction to Wellington. He is knowledgeable and friendly. I would recommend him to others visiting the city. Robbie was a great guide. His knowledge and ability to set up and deliver a flexible day and a flexible tour made our day. Great guide. TOUR GUIDE RESPONSE: Thanks very much Bob, not just for the review but also for the challenge of an interesting and varied day. Glad you enjoyed it. Robbie's tour was the highlight of our trip to New Zealand. His extensive knowledge of his country, Wellington, and Peter Jackson's trilogy, along with his personal stories of his four years working on the films made us feel like true insiders. If you are going to Wellington you must book this tour. Exceptional. TOUR GUIDE RESPONSE: Thank you very much Jay. It was a pleasure to meet you all and to be able to share my experiences with you. It was a pity about the weather, but I'm glad you all had an enjoyable time anyway. TOUR GUIDE RESPONSE: Thank you for your comments Steve. In answer to your queries, I designed this tour as a Get Away from the city, a visit to some of the beautiful nature and scenery of NZ, and in particular, Wellington. I am sorry it wasn't as you expected and I appreciate you taking the time to comment. I hope you enjoyed the places I recommended for your second day in Wellington and the rest of your time in NZ. Great tour. Very comprehensive and interesting. Highly recommended. TOUR GUIDE RESPONSE: Thank you very much Debbie. It was great to meet you all and to be able to show you around. Robbie was right on time and we had a very nice visit to Wellington seeing many sites and having a very nice lunch by the bay. He was very informative about the city. TOUR GUIDE RESPONSE: Thank you very much Karen. It was lovely to meet you all and to be able to show you around. And I'm glad you enjoyed the lunch at the Chocolate Fish - it is always one of my favourite places. We took a 7 hour tour in Wellington. We booked it a few months earlier and the communication with Robbie T. Was excellent. He customized the tour for us ( we were a party of two) based on our interests and physical limitations. The tour itself was wonderful and reasonably priced. Robbie is very knowledgeable about Wellington and surrounds? If you are interested in Lord of the Rings, nobody better to show you the filming site. He had a role in the film. Highly recommend. TOUR GUIDE RESPONSE: Thank you very much. It was great to meet you both today and enjoy Wellington on a beautiful sunny day. Enjoy the rest of your travels. our tour was guided by Robbie in wellington NZ for the whole day, we had such a great experience and fun time with him, Robbie was very energetic and had great knowledge about this tour and beyond, we learned so much about how the movie "lord of ring" was made, if anyone take this tour in future, strongly recommend to chose Robbie as your guide, a job well done! TOUR GUIDE RESPONSE: Thank you Jennifer. It was great to meet you all and to be able to share my stories and experiences with you. Thank you also for making the day so enjoyable. TOUR GUIDE RESPONSE: Thank you very much Irene. I'm glad you enjoyed your day today and I hope you enjoy the rest of your cruise. Robbie was terrific. Great communication prior to the tour, adapted to our schedule, and generally ran a great tour. Recommend highly. TOUR GUIDE RESPONSE: Thank you very much. It was great to meet you guys today and to show you around. I hope you also enjoyed your time at the Museum as well. It was a pleasure to tour Wellington with Robbie, a highly knowledgeable and flexible guide. He proudly shared his city and filled us with interesting stories of his family going back 5 generations living in Wellington. We made itinerary changes during our tour and Robbie was very amenable. At the beginning we mentioned an obscure interest and an hour later he took us there! We highly recommend Robbie. TOUR GUIDE RESPONSE: Thank you very much. It was great to meet you both and to be able to show you the highlights that you wanted to see (especially despite the weather). I hope you enjoyed the rest of your cruise. Robbie was great. He was very flexible - we pulled our tour into an earlier time and he had a great attitude about it. And he was very informative about all things New Zealand. TOUR GUIDE RESPONSE: Thank you Rebecca. I'm pleased that you enjoyed the drive (and at least we had some good weather for it as well). Hopefully next time you come to Wellington, I will be able to show you around as well. Robbie was a very pleasant guide. He answered all our questions and was agreeable to our requests. We enjoyed talking with him as he showed us all the sights in Wellington especially when he suggested where I should stand on the cable car to view the fun light show in the car's tunnel. Robbie is a knowledgeable guide who enjoys the outdoors and has a in depth knowledge of the history and buildings of Wellington. His love of place comes through his guiding. My husband and I had a lovely and relaxing time being guided around Wellington, Zealandia, and some wetlands northwest of Wellington. Robbie did a great job guiding us to see birds in the wildlife area. He knew how to spot them and he explained many things about the area to us. We really enjoyed our day with him. Highly recommended! TOUR GUIDE RESPONSE: Thank you very much. I'm glad you enjoyed your day out and about in Wellington, and being able to see some of the natural beauty of NZ. Robbie was a wonderful and knowledgeable guide, and we had fantastic day with him. Comfortable car and very accommodating to our specific needs. If you are on a cruise ship, don't be afraid to book a private tour with him. Much less expensive than the ship's tours, you'll see everything, and he will have you back to the ship in plenty of time. Actually picked us up and dropped us off closer than the tour buses did on the dock. Thank you Robbie for a wonderful day. TOUR GUIDE RESPONSE: Thank you very much Anne. It was great to be able to show you all around (and well done on getting a nice day in between some stormy days!). I hope you enjoyed the rest of your travels. Beautiful city for photographs with water everywhere. We enjoyed our tour with Robbie very much! We loved that he showed us actual pictures from the movie as we walked in the areas it was shot. His experience as an extra in the films is a real plus. Enjoyed our lunch at the Chocolate Fish and the tour at the Weta Cave! TOUR GUIDE RESPONSE: Thank you very much for your rating. It was fun to be able to show you around and share some of my on-set stories. So glad you enjoyed the day and that it has added to your enjoyment of the movies. What a fabulous day. Couldn't ask for a better tour guide. Robbie is knowledgeable, fun and friendly. The tour was diverse, interesting and all-encompassing. Couldn't recommend more highly. You will not be disappointed I assure you. TOUR GUIDE RESPONSE: Thank you very much Irene. I had a very enjoyable day with your family, being able to show you many of the different highlights of my home. Robbie has a wealth of behind the scenes knowledge about LOTR because he was an extra in four of them. Combined with all the expected sights and information, this made for a very enjoyable day. Great tour and a Great guide. TOUR GUIDE RESPONSE: Thank you very much Terry. It was an enjoyable day being able to share some of my experiences and stories with you. Hope you enjoyed the rest of your travels. Very worthwhile and interesting. Robbie was so engaging. Highly recommended. TOUR GUIDE RESPONSE: Thank you very much. I enjoyed the day as well and spending time with you. I hope you enjoyed the rest of your travels. A great tour in a lovely setting. Robbie did a wonderful job of tailoring our tour based on our personal preferences. Being introduced to Wellington by a Kiwi who loves Wellington made the tour even better. TOUR GUIDE RESPONSE: Thank you very much Denise. It was great to meet you all and to be able to show you around on such a beautiful day. Hope you enjoyed your dinner as well. Robbie did a great job and I am delighted that I used his service. His car was great and his knowledge of Wellington was really in depth. He accommodated our desires. He also expertly guided us through the National museum. I highly recommend him. TOUR GUIDE RESPONSE: Thank you very much Mark. But you guys (and the weather) made my job easy. Enjoy the rest of your travels and your stay in Auckland. It is absolutely great when you have a guide that was an extra on the movies telling you about his experiences in addition to showing the locations that the LOTR movies were shot at around Wellington. TOUR GUIDE RESPONSE: Thank you Clay. It was great to meet you and to be able to show you around and to share my stories with you. All the best in the rest of your travels. Robbie is a great tour guide. He clearly loves New Zealand and Wellington, specifically, and is very knowledgeable about the things we tourists are interested in -- such areas as history, economics, current events and statistics. Our day with Robbie was well planned and we saw and experienced a great deal in our time in his care! We would recommend highly and without reservation! Robbie was a reliable guide who knew the city in and out and was able to show us around and add extra history and context to a lot of Wellington. TOUR GUIDE RESPONSE: Thank you very much for your comments. It was good to meet you both and show you around. I hope you enjoyed your time in Te Papa and hopefully got to see the Beehive the next day (despite the weather). TOUR GUIDE RESPONSE: Thank you very much for your rating Patt. It was good to meet you all and be able to show you around Wellington. Hope you enjoyed the rest of your trip. Robbie provided an extremely enjoyable and educational personal tour for my wife and me. His knowledge and love of the Wellington area was obvious from the moment the tour began. We loved his personal stories of playing the part as an extra in the Lord of the Rings series. We recommend Robbie highly to anyone wanting to spend a memorable time being introduced to Wellington, New Zealand. Highly knowlegeable and delightful personality. TOUR GUIDE RESPONSE: Thank you very much Aubrey. It's been a while but I remember we had a very enjoyable, relaxed day! We appreciated the knowledge and history provided and flexibility to begin with Te Papa museum. Robbie was very personable. We understand that the weather was not great the day that we were there but would have liked to have had guide a little more versed in inclement weather activities with other suggestions not just a check list of what we should see--ie, just driving around the bay was not interesting to us and we were not especially interested in lunch break & not impressed with Chocolate Fish. A superb tour with a superb guide. Robbie quickly found out what our interests were and took us to places that more than filled the bill. We would recommend this tour and this guide to everybody. Robbie was excellent! He was well prepared for the tour & he was actually in the Lord of the Rings movies. He took us to so very famous filming locations, let us "role play" as hobbits and wizards and elves. He was personable, practical, & wanted to be sure we got the best possible tour. I would highly recommend this private tour for anyone who has an interest in the LOTR movies (or Narnia, for that matter). His selection of places to eat was also fantastic.I not only give the tour 5 stars but Robbie too! TOUR GUIDE RESPONSE: Thank you very much Corrie. I had a great day being able to show you around and share some of my stories with you. Pleased you got to see your own personal "Paris" and I hope you enjoyed your time in Hobbiton later in the cruise. We had a nic e day with Robbie seeing all the sights of windy Wellington. The lunch at the chocolate fish was a highlight . Thank-you! TOUR GUIDE RESPONSE: Thank you Judy. It was great to be able to show you both around as well. I'm glad you both enjoyed the day. This was a fantastic tour. By far the best tour we experienced on hour trip. Robbie was well versed on the history of Wellington, the government of New Zealand, and the filming of the "Rings" movies. He provided a thorough tour of the city and nearby areas including a great lunch we had near the bay. He was very flexible and willing to adjust the itinerary to fit our interests. He was very personable and a delight to spend the day with. Anyone interested should definitely consider Robbie as a guide. Robbie is a very pleasant guide who made great suggestions for our tour and was willing to adapt to any changes or requests we had. He is knowledgeable on his home and provides good dialogue. His tour description indicated a station wagon for transportation but he rented a 6 seat mini van so that we were more comfortable as a tour of 4 people. The price to value relationship was excellent. TOUR GUIDE RESPONSE: Thank you very much. I had a very enjoyable time and loved showing you all around. I hope you enjoyed the rest of your time in Wellington and found a nice place for dinner that night. A little apprehensive booking a tour with a company I hadn't dealt with. Was soon dispersed upon meeting Robbie our guide. This guy was fantastic, knew the city and all the places to go He packed more in in our five hour tour than any other tours we went on in Australia and New Zealand. Highly recommend him and the company. Good follow up through out with Tours by Locals. Thanks again Robbie. TOUR GUIDE RESPONSE: Thank you Laurie. It was a fantastic day and I had lots of fun with you all as well. Robbie tailored our tour perfectly to our needs, was punctual, organized, informative, knowledgable, and flexible. His love for his home town is apparent, and well deserved from what we experienced. Our highest recommendations. TOUR GUIDE RESPONSE: Thank you very much Mike. I had an enjoyable day as well and it was a pleasure to show you two around my beautiful home! We enjoyed this tour and Robbie was an excellent guide. It was striking to see the difference between the scenes in the movie and the actual places where those scenes were filmed. The WETA studio tour was a nice complementary addition.